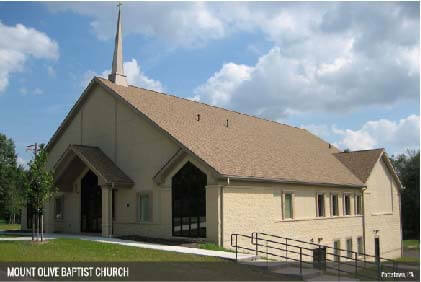 Pastor William H. Ball, III and the congregation of Mount Olive Baptist Church in Pottstown, PA hired S. E. Smoker, Inc, (now DESCCOCHURCHES) to construct a brand-new church facility for them at the corner of Jackson and Mintzer Streets, Pottstown Borough, Montgomery County, PA. This new Mount Olive Baptist Church construction project is on a site slightly less than 2 acres. The main floor of 5,980 sq. ft. has a narthex, lavatories, several offices, audio visual room, and a sanctuary with fixed seating for 226 persons. The finished daylight lower level of 5,725 sq. ft. has several classrooms, lavatories, a kitchen and fellowship hall, and children’s church area. The entire new building totals 11,705 sq. ft. The structure of the church building consists of split-face block foundation, steel bar joist and concrete floor deck, wood framed walls, and a clear span wood truss roof system. Exterior finishes are split-face block, flexlite, and asphalt shingles. DESCCOCHURCHES conducted the following pre-construction services for this project. For more information, floor plans, and budget costs for your upcoming church construction project, contact DESCCOCHURCHES Today! Learn about our church design services.